Many people seem to think of Google Docs and Apps as a great replacement for an LMS and this may be true in many respects. However, one place a good LMS scores is in giving access to useful data about student activity. In my last engagement, I regularly spoke of Course Reports as one of Moodle’s “hidden” features because teachers did not seem to grasp their significance readily. Perhaps because, in a normal classroom situation you develop a “feel” for the way things are going – although there is research to show that in larger classes, teachers might not be as aware of all the inter-actions as they believe themselves to be. In a blended or fully online situation, these reports are very useful data for tracking each student’s progress and for evaluating the course as a whole. Those charged with Q&A of courses will also find these resources valuable. Some of these depend on the appropriate course settings (eg completion criteria) having been set up in the course settings. You can select by group and activity or show all the relevant activities on a given day. This can be used to look at the activities of groups or participants and get a general feel for the level of activity. In the event that something untoward happens in your course, a certain amount of tracking can be done – including the apparent location of the activity via the IP address. With this report, you get a count of views of each activity or resource in the course giving you an indication of those most heavily used. This information can be useful in review and for planning feedback. You might ask students why a particular resource was not seen as useful. This one works for a given course activity and looks back over a specified time period. For example, the last 4 weeks. Here you can see exactly who has accessed a resource or activity in the course and who has not. This could be useful information when dealing with a student demonstrating a lack of engagement. The report includes checkboxes which, when selected, allow you to send a message via Moodle’s IM system to one or more students. Perhaps a timely reminder about viewing resources or participating in activities. Completion tracking which allows you to fine tune the process. 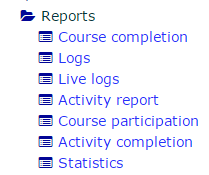 If course completion is set up correctly the student can also view reports of their own activity. The course statistics allow you to look at a graph showing for each role, the number of views one or more course activities/resources has received. As well as the graph a table is provided with links to the corresponding logs. If you set this for all activities and the student role, you can get a good overview of the “rhythm” of the course. Book Review: Moodle Multimedia Cookbook.